It’s January, and there are a million resolves to make healthier changes; to exercise more, to eat better, to get more sleep, to connect deeper, to make the 180° change that’s going to revolutionize our lives. And by now, heading towards the end of the month, how’s everyone doing? Still holding on? Going strong? Let’s put our collective fingers on this a moment. We all think about it each year, come January. We’re determined, striving ahead. And somewhere along the way, there comes a realization that change is hard. As a species, we don’t handle change all that well. If you don’t agree, look at the amount of griping that occurs any time Facebook makes changes, or what happened when Twitter recently went through it’s re-design. (for the record, I like BOTH new sites much better) and you realize that it doesn’t take much to make us feel like the earth is being yanked out from underneath us. And inevitably, a lot of those changes we want end up falling by the wayside because if we’re truly honest with ourselves, we will admit that change is very, very hard. I’ve been there. Done that. It is really hard to make positive and lasting changes, and these will take time, regardless of what they are. In August of 2007, I realized that I needed to lose some weight. What I saw in a photograph made me cringe. It was NOT pretty. Still, I didn’t actively embark on making those changes, much less following through until November of 2008, well over a year later. But by the time I did implement what I needed, I stuck with it, and in the Spring of 2009 I was 25# lighter and down two pants sizes. So the bottom line for me was to get both my head and my heart around what needed to get done. Once that happened, there was little to stop me. Changes take time. Habits don’t form overnight. If you really want the success of integrating new habits into your life, give it time and give yourself a break. Berating failure only pushes us backwards, and we all have off days. There’s no goal you can reach for that has to have a set time limit, nor any that isn’t amendable along the way. If it’s weight loss you seek, take baby steps and celebrate the first 5 pounds, then the next. Pay attention to how your clothes fit because sometimes that’s a better indication of what your body is achieving than the number on the scale. And please, please, please…… don’t use the word “DIET”. For every person alive, “diet” rings with deprivation. A wonderful friend of mine admits she needs to make some big changes in her eating habits, but laments “I don’t want to be eating oatmeal and plain chicken breasts for the rest of my life.” So instead of considering it as a “diet” I suggested she think of it more as a permanent lifestyle change, because that’s what it boils down to in the long run. And it won’t happen overnight. Do the baby steps and celebrate each one instead of dumping the contents of your refrigerator and pantry in the trash and then thinking “What now?” The habits we’re ingrained with didn’t occur in a few days, they took months, and sometimes years to build up. And to reverse them, they could feasibly take months, or maybe even years to become something new, something better for you and wiser, overall. And food habits are hard to change. Long ago I used to be addicted to Burger King french fries, and Wendy’s Chicken Nuggets. I would see their signs as I drove and get an undeniable craving, so bad that I almost broke out in a sweat. I know! It was awful! And on one occasion as I stuffed those first hot golden french fries in my mouth, I was hit with the realization that they tasted simply awful. But guess what I did? Yep. I ate the entire order anyway. My mouth felt like it had been assaulted; it was coated with this horrible aftertaste, heavy and greasy. And my stomach hurt. I was appalled at myself because even when I clearly realized that I didn’t even like the product, I kept eating it anyway. It was the same with Wendy’s; I could consume two orders of their Chicken Nuggets without a single hesitation despite knowing I didn’t even like them, yet the one day that my brain equated those nuggets with warm rubbery sponges was the last time I ever put one in my mouth. Still, I couldn’t tell you how long it took me to get there. It was an embarrassment to me, and I really struggled to kick those habits, as well as many other unhealthy ones I used to have. I’ve made drastic changes to my eating in the last 5 years, and have noticed immeasurable improvement to my health in the process. It’s no cliche that when you eat better, you feel better. I know through personal experience. Just recently I drank Diet Coke- with fresh squeezed lime wedges in it!- for the first time in ages, and man what a stomachache! It tasted all right, in fact, it tasted really good but I seriously wanted to cry because my stomach was so twisted up in knots. As uncomfortable as I was, I rejoiced also, as it instilled in me the same resolve that the french fries and chicken nugget revelation did; this isn’t good for me, and I shouldn’t be consuming it. But still, it took time for me to get there. And it will take time for you too. Take the baby steps, celebrate the small victories and be kind to yourself in the process. If there’s one meal you want to change this week, you could try out this nutritional powerhouse of a salad. It requires no special ingredients, and is really inexpensive to make. 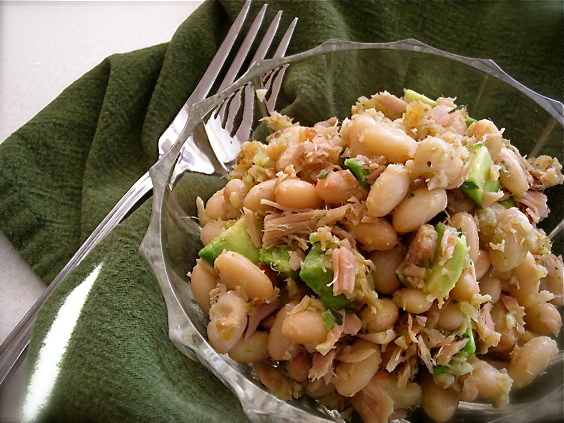 This garlicky White Bean Salad with Tuna and Avocado is a super-bomb of good food to put in your body. It’s full of fiber to keep you satiated and operating at open throttle all afternoon, with the very important Omega-3, and monounsaturated fats that our bodies need. It’s also quick, and works equally well as a warm main dish with a few good sides, or a quick cold salad for your lunch. And the garlic is cooked, so your family and co-workers are safe. I had a small bowl of this for lunch, along with some fruit and by dinnertime I wasn’t even hungry. I love meals like that. Drain tuna well and place in a large bowl. Flake with fork until shredded. Heat a skillet on the stove and add about a tablespoon of olive oil and the garlic. Heat gently over medium-low heat, stirring occasionally until the garlic is translucent and fragrant, 3-5 minutes. Be careful not to burn the garlic!! Stir in herbs and great northern beans. Heat through, stirring, for about 5 minutes more, drizzling in a bit more olive oil to coat. Remove from heat and add to bowl with tuna, mixing well. Stir in avocado, season with salt and pepper and serve warm. Can be chilled as well. Canned salmon can be subbed for the tuna, or chopped sardines if it’s your thing. You can add finely chopped veggies as well, like celery or red pepper or cucumber. Rosemary is really flavorful in this too. If you want to get creative with it, the entire dish can be put through a food processor and used as a spread for a wrap, on top of toasted baguette slices or thinned a little with milk or water and used as a dip for fresh vegetables. This sounds so good. I am out of white beans so I’m using garbanzos. Can’t wait!!!! I also have the same experience with diet colas, they always make my stomach very uncomfortable–how is it that so many people drink that stuff? Of course, what a splendid blog and enlightening posts, I surely will bookmark your blog.All the Best! I plan to make this with canned Chicken, looks delicious! Yes, finally a person that shares exactly the same thoughts and ideas on this as me. Great stuff. Absolutely love your site. I just have to tell you something you will not want to hear, but I am excited, so I have to share. I joined Weight Watchers January 3 and as of today, January 24, I have lost 20 pounds……!!!!! Your recipe looks like something I will use this week. Thanks.